You can call me picky if you like but, when I was at school, a half meant a half. 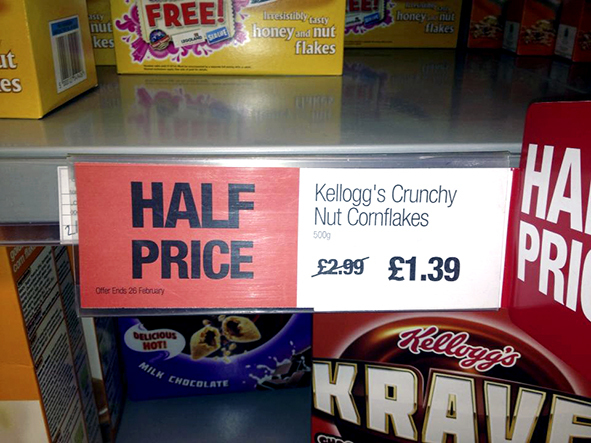 But, according to Jack C who spotted this in his local Co-op, that's not true any more. OK, so it's a better bargain than advertised. But what's tragic is that this particular Co-op is situated in the heart of Leeds's student area and must, I have no doubt, employ Maths students as part-time workers. You'd think they'd have noticed. Or perhaps, assuming they work half the normal hours, they'd be happy with only 46.5% of the pay.